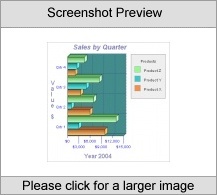 For a limited time, 2D/3D Horizontal Bar Graph (Servlet) - Source Code, will be offered for a special of only $999.95 for a limited time for this version! Click here to order now! This 2D / 3D Horizontal Bar Graph provides both a client and server side solution for the incorporation of bar graphs into web pages. It provides versatile components so that web authors and Java developers can easily build and publish dynamic and interactive bar graphs. We have built in many configurable features and functions to both the applet and servlet and as such, the documentation and examples are designed to give both a full understanding of every feature and enable you to implement both the applet and servlet quickly and easily. The series of examples give an overview of the variety of implementations possible. Try the free trial version first, or click here for pricing/to purchase a full version! Order by phone, fax, cheque, money order, or order securely online!